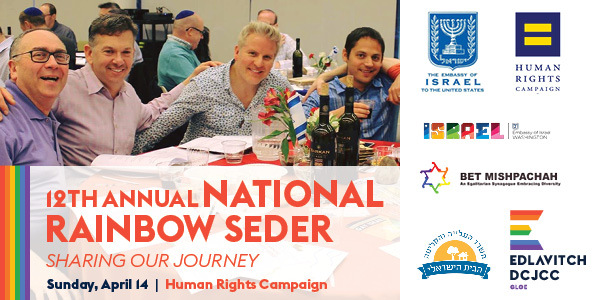 Now in its twelfth year, the National Rainbow Seder is one of the nation’s largest and longest-running Passover seders for the queer Jewish community and its allies, co-presented by GLOE - GLBTQ Outreach & Engagement at the Edlavitch DCJCC and the Human Rights Campaign’s Religion & Faith program. Hosted inside the Equality Center ballroom at the HRC headquarters in Washington, DC, this year’s program will feature a full Passover seder complete with a specially-commissioned Haggadah (the Jewish text containing the Passover story) retelling the traditional tale of Jewish triumphs of resistance alongside the hard-fought progress made by the LGBTQ equality movement over the past decade since the National Rainbow Seder's inception. This event is co-sponsored by the Embassy of Israel to the United States, Bet Mishpachah congregation, and the Israeli House.